New Cerberon Beta 1 Available! It's been a long time coming, (mainly due to some optimization struggles) but the first Beta release of New Cerberon is here! Enjoy, and don't forget to leave some feedback! No, this isn't the Sonic Mayhem track. I'm just here to tell you about the 1st Alpha for my new QL CTF map, "New Cerberon". Yesterday, the second edition of the Sparta Cups hosted by Puffdar had finished, with "reload" emerging victorious. Streaming was performed on one of the servers in France, with more games played on the Warsow E-Sport Servers and the YOBA servers. The games were fun to watch, and it was intriguing to observe players battling on my map in such a competitive environment. I'll be using much of the advice given during the Sparta Cup and on the Warsow thread to make improvements for the third beta of Catharsis, and hopefully the last one before it gets the finalized status. 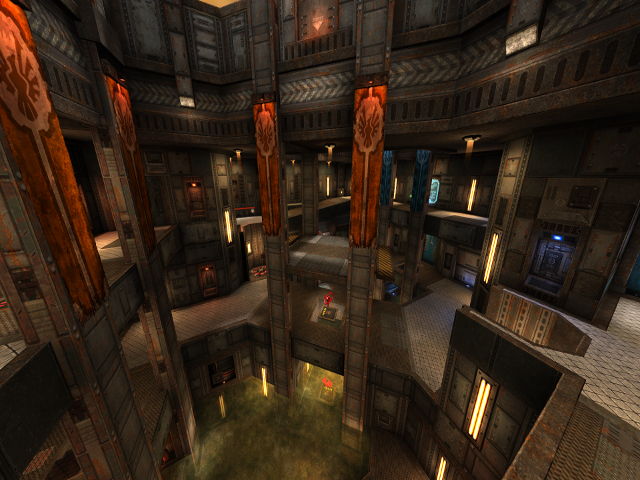 Some truly wonderful news to deliver - my Warsow map Catharsis (Beta 2) is featured in the map pool of the Sparta Duel Cup #2, organized by Puffdar. The date is set for December 23rd, and this Sunday the prize money (courtesy of several generous donators) from 1st to 8th place will be announced. Thanks to Puffdar for the announcement and organization of the cup. Hope to see some awesome matches on it!